OPSIM | What is OPSIM? OPSIM is an operational simulation tool for the assessment, design, and management of water resource systems. It allows the user to rapidly build a system model which forms the core of the analysis and insight available through OPSIM simulation. OPSIM then uses this system model to perform multiple types of analysis, and can then post-process the data produced into user friendly formats. Below is a focus on several key features of the OPSIM system; for further information please read the applications section, or the products area. The most important step in OPSIM analysis is the creation of a robust system model that is used for analysis. OPSIM uses linked node models to capture system behaviour, and to perform a full mass balance. Models are created with a simple to use and self-documenting interface which ensures that the user provides all necessary information to produce a robust system. OPSIM also performs multiple checks to ensure there are no errors in model generation and linking. OPSIM comes completely preconfigured to allow the rapid creation (or modification) of complex systems, without the need for expert knowledge. Preconfigured capabilities have been tailored to cover all typical requirements in mining, industry and agriculture. These capabilities include, for example: catchment hydrology; water storage and distribution; ore processing and tailings management; water quality, its variation, management, processing and treatment; irrigation and land application. Models may be static, or linked as scenarios that represent changing configurations over any period of time. This allows the complete life of mine operations to be easily modelled and investigated. OPSIM uses water balance modelling across all nodes to account for the motion of water within the system. That is, every kilogram of water, solid and analyte that goes into a model is fully accounted for at every time-step. In the OPSIM GC version, change balancing is also tracked to include the effects of suspended solids and conservative ionic compounds. This allows OPSIM to accurately model water quality and water processing plants with variable rates of feed rate and quality. The accumulation of solids in a system is critical in modelling the life cycle of tailings storage facilities. OPSIM will track the movement and accumulation of solids, with full account of density, moisture content and time-based consolidation of deposited tailings. The quantity of analytes contained within deposited tailings is also tracked, as too is its release back into the water column through dredging or similar. A single OPSIM model can be run in a variety of modes, to suit the type of analysis being performed. Usually the first simulation mode run is called historical mode. In this mode the historical climatic data sequence (rainfall and evaporation) is directly applied to a model, and simulation used to establish the system's response to this sequence. Simulation output can then be compared against historical records to confirm satisfactory model operation (calibration). Statistical analyse may also be applied to simulation output to quantify system performance for comparison against standards or target benchmarks. OPSIM includes a suite of statistical analysis of graphing tools to allow the rapid assessment of simulation outcomes, and their export to other platforms for reporting or further analysis. Move the sliders above to change the size of the catchment or the volume of water flowing in from a river. 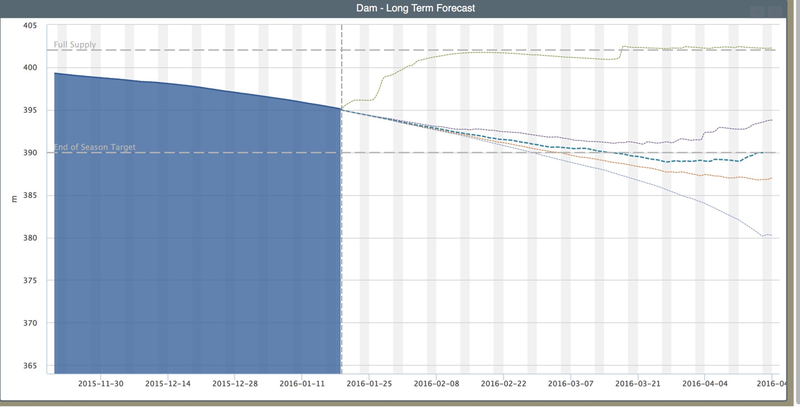 Performance forecasting is one of OPSIM's most powerful simulation features. Given the current status of a system (e.g. storage volumes), a user can switch OPSIM to Forecast mode and then immediately produce time based confidence traces of forecast system performance for future periods. Using this tool, the consequences of possible alternatives system operational strategies can be tested and quantified for side-by-side comparison to a range of risk of occurrence profiles. OPSIM bases its long-term and seasonal forecasts on the historical climatic record for a site (one or more rainfall stations). Although short term forecasts (i.e. 7 day) can also be readily made using the same technique, prevailing climatic conditions at the time will usually dominate. Fortunately, confidence based forecasts of short-term rainfalls are now available within many countries throughout the world, and these may be directly loaded into OPSIM to perform forecasts using this alternative climatic data. Use the toggle to change between the large number of simulation traces and a confidence trace for the data. A powerful feature of OPSIM GC is its ability to track the concentration load of any number (practical limits associated with computer memory apply) of dissolved solids (analytes) throughout a system being modelled. Analyte source can be defined via a variety of mechanisms associated with catchment generation, ore feed, direct feed, initial and feed water quality etc. OPSIM GC includes a number of specialist node types for the modelling of a variety of water treatment processes (e.g. reverse osmosis, mechanical vapour reduction, chemical processing). Some of the processes include precipitation of crystalline solids and sludge, which are also tracked. Tracking of water quality occurs both with general water movement and mixing, and as it is bound up within deposited tailings. Deposited tailings can be remobilised within a models operation, and OPSIM will mix and transport these remobilised analytes as normal. Many industrial and mining operations are permitted to release water from their operations into the receiving water environment, but usually only under specified conditions of compliance (e.g. maximum allowable flow rates, receiving water quality limits). OPSIM includes a comprehensive set of operational procedures that can be easily configured to operate simulate releases when suitable conditions prevail. This capability is extremely valuable when using OPSIM for either design or operational management applications. Any OPSIM model may be run in Adaptive Real-time Simulation (ARTS) mode without any reconfiguration (OPSIM RT extension required). In this mode of operation, OPSIM is set to undertake a single "pulse" simulation on a regular basis, real-time. The interval between pulses is set to suit the particular application, but typically it might be anywhere between 1 minute and 1 day. At each pulse, OPSIM automatically updates its status (e.g. storage inventory levels, rainfall since the last pulse) on the basis of available telemetry data. Information that is not metered is then automatically calculated by OPSIM when the pulse simulation is done, taking full account of all actual measured data. Selected simulation output is then automatically written by OPSIM to files that are then available for other external systems to access (e.g. operator consoles, databases and related information systems). In addition to simple pulse ARTS, OPSIM can be set to automatically undertake Forecast Analysis (using both short-term rainfall forecasts, or long-term seasonal forecasts) and to also make this available for external operators to utilize. In this way, OPSIM can be used to provided system operator with, automatically updated available telemetry data, with OPSIM infilled estimates of all other information not directly measured – all real-time without the operator having any direct interaction with OPSIM. Forecasts provide the operator with risk based traces of simulated performance characteristics for real-time advanced warning of potential future event occurrences.